Doris Day, Kirk Douglas, Young Man With a Horn, 1950. 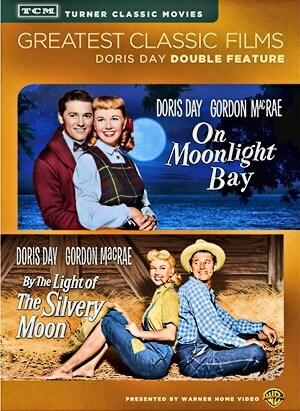 Although Doris Day had been the centerpiece in all three of her previous films and would get top billing for the first time in her next picture, “Tea for Two“, she was not the main character in this one. Young Man With A Horn, Kirk Douglas was, as Rick Martin, a character based on the life of the great jazz cornet player, Bix Beiderbecke. Rick Martin becomes fascinated by the trumpet at a young age and is mentored by Art Hazzard, a trumpet player who becomes the father figure in Martin’s life. Grown up, Rick is obsessed with jazz and has thoughts of nothing else. After Hazzard leaves on tour, Rick secures a good job playing with a band. He is befriended by its pianist, Smoke Willoughby (Hoagy Carmichael) and by Jo Jordan (Day), the band’s vocalist. Trained as a jazz musician, Rick is fired for improvising instead of playing the songs as written. When he leaves, Smoke quits the band and together they set out to conquer the music world. They play in dives, burlesque houses, and jukebox joints from coast to coast. Meanwhile, Jo begins to enjoy greater success as a singer, appearing in top clubs from California to New York. 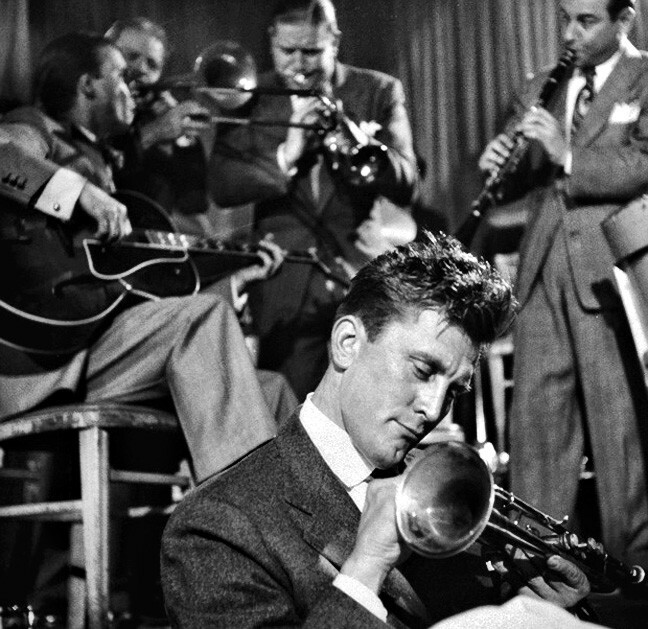 Kirk Douglas as the Young Man With a Horn, based on the story of Bix Beiderbecke. When Rick’s travels take him to New York, he is reunited with Art Hazzard, who is playing at a swank club in Greenwich Village, and with Jo, who is headlining at the Strand Theater. She arranges a band job for Rick and his star begins to rise quickly. 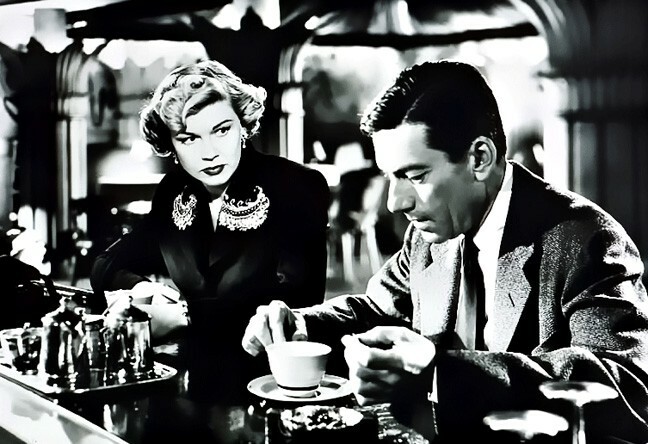 Jo also introduces him to her friend Amy North (Lauren Bacall), who is sophisticated, cool, and wealthy. She and Rick are wed, but the marriage becomes tumultuous, with Amy attending school during the day and Rick playing all night in clubs. When Amy begins staying out and not coming home, Rick takes to the bottle. 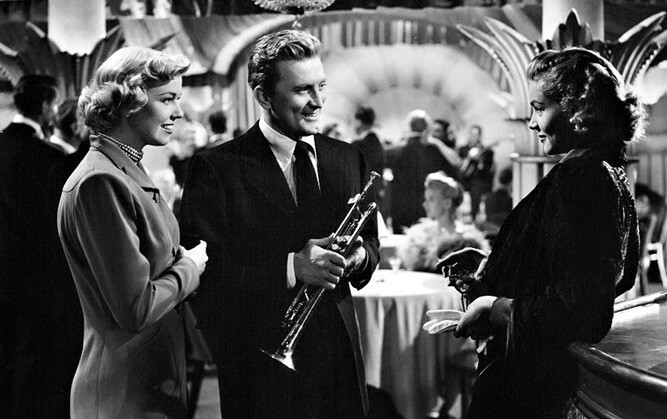 Doris Day, Kirk Douglas, Lauren Bacall, Young Man With a Horn. This is a well-written script by Carl Foreman and Edmund H. North, based on the novel by Dorothy Baker. The whole production is first-rate, thanks to the direction of Michael Curtiz. The characters of Rick Martin, Jo Jordan, and especially Amy North are finely drawn. 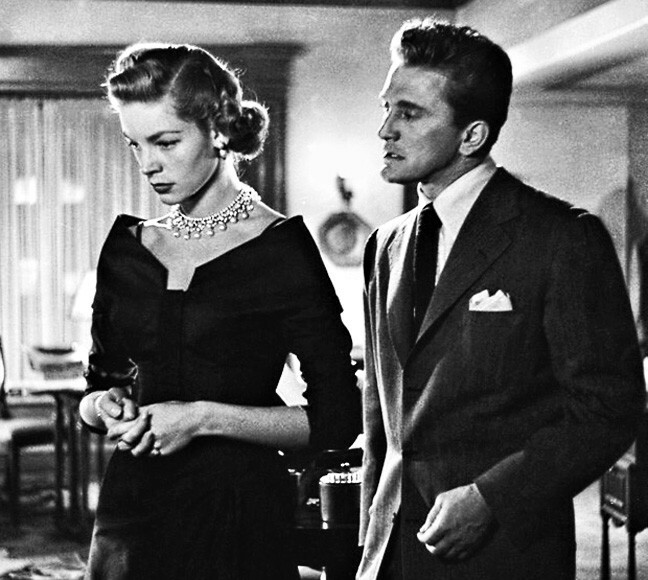 Miss Bacall gave an excellent performance, as did Kirk Douglas and Hoagy Carmichael. Juano Hernandez was good as Art Hazzard. 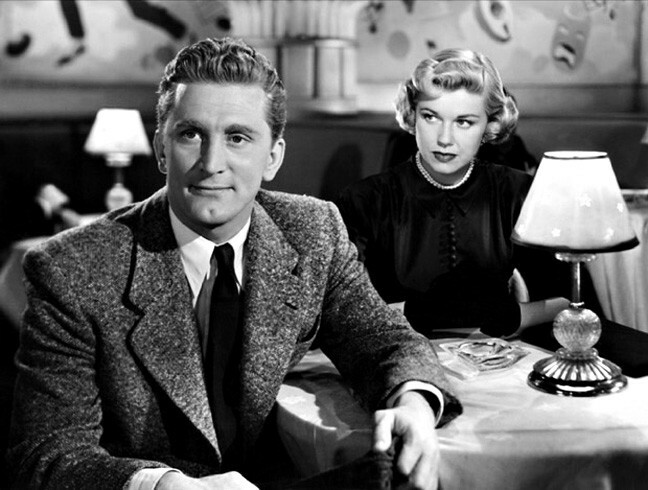 Kirk Douglas, Doris Day, Young Man With A Horn. Doris Day held her own in this, her first dramatic performance. Her singing (of such standards as The Very Thought of You, Too Marvelous for Words, I May Be Wrong, and With a Song in My Heart, is wonderful throughout. Harry James’ trumpet playing for Kirk Douglas is thrilling. Credit, too, goes to Day’s colleague from Les Brown’s band, trumpeter Jimmy Zito, who dubbed the playing for Juano Hernandez. On this viewing, I appreciated Day much more than before. I think it may take two or three viewings of this to really absorb the magnitude of all that happens here. The movie seems rather long at 112 minutes, but there is nothing here that won’t be of interest to serious moviegoers. Much of the film looks to have been shot on location in New York, but if it wasn’t, kudos must go out the set decoration by William Wallace. Michael Curtiz proved, once again, that he was one great director. This is the movie that inspired a number of hopeful young moviegoers, like Frankie Avalon, Sal Mineo and others, to try acting as a profession. That’s a respectful tribute to Mr. Douglas. 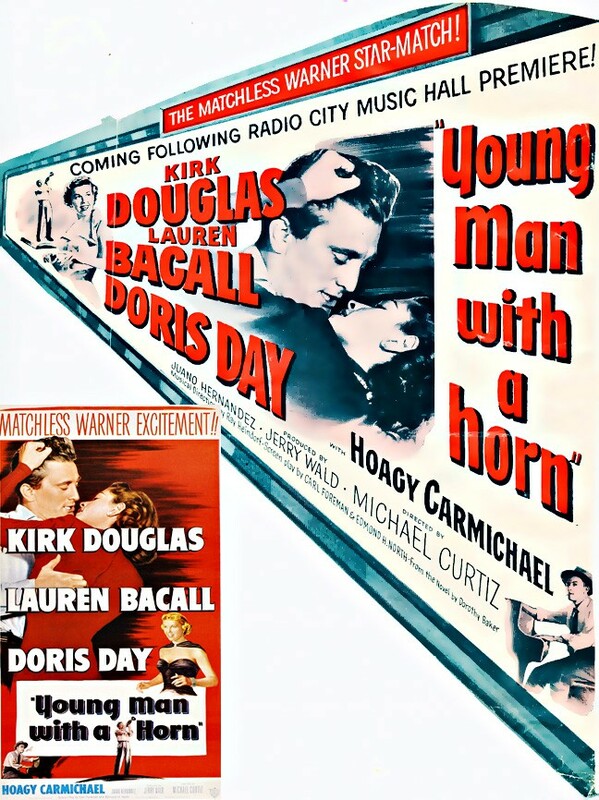 Doris Day, Hoagy Carmichael, Young Man With a Horn. 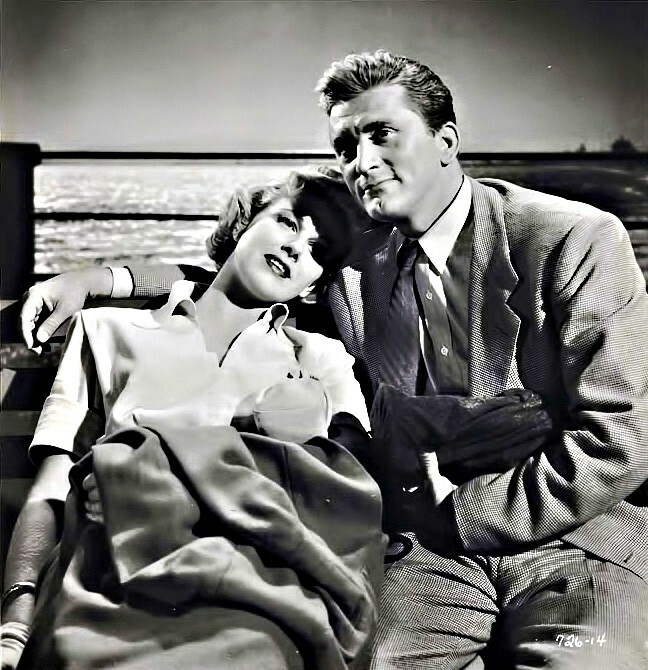 Kirk Douglas, Lauren Bacall, Young Man With a Horn. “When Isodore Demsky and Betty Perske dated in New York, they little dreamed they’d one day co-star in a movie biopic of their hero, jazz cornet player, Bix Beiderbecke. 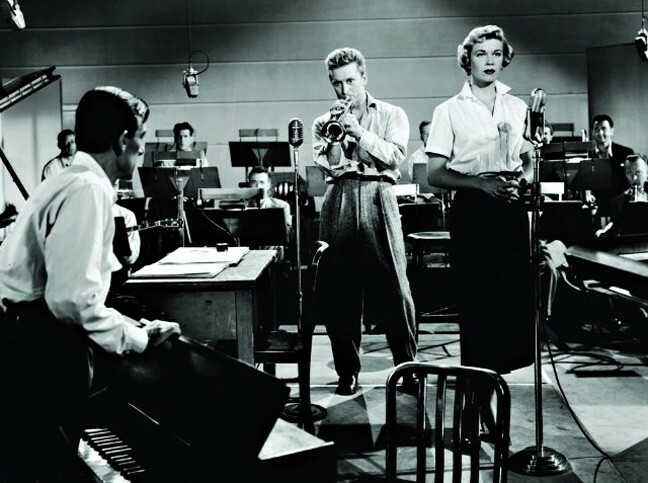 But here they are on the Warner Bros lot, now rechristened Kirk Douglas and Lauren Bacall respectively, he dubbed by the great Harry James on trumpet, and she playing a daring for its day society closet lesbian.